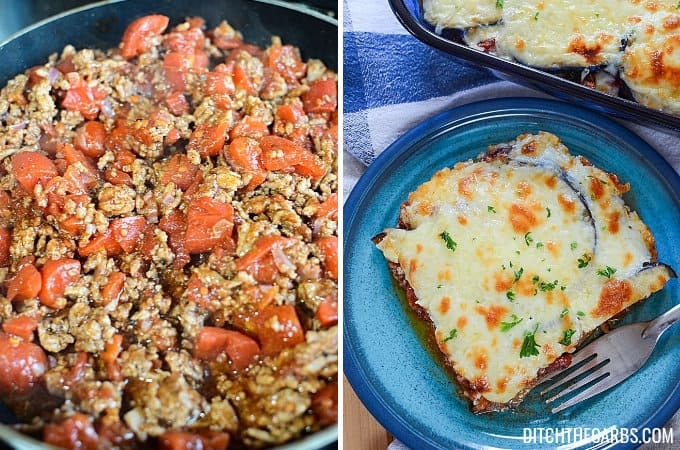 This is an easy peasy version of low carb moussaka. The only fiddly bit is frying up the eggplant (aubergine) slices then assembling the moussaka, but this can all be done whilst the oven is getting up to temperature. I have tried many versions of a béchamel sauce, and I must say that I love my ‘cheats version’. Just throw all the ingredients in a measuring jug and whisk with a fork. The sauce is made with natural yoghurt and feta. There’s none of this melting butter, adding flour, cooking the flour, adding the warmed milk, simmering …… blah, blah. blah. You can gather by now, all my recipes are fast and simple. 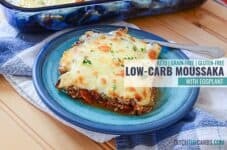 This low carb moussaka is tasty and packed with vegetables, layered with mince and topped off with the béchamel (cheese) sauce. You can also add other vegetables such as sliced zucchini. It may also be made a day or two before you need it. My low carb moussaka is gluten free, wheat free, primal and of course, low carb. 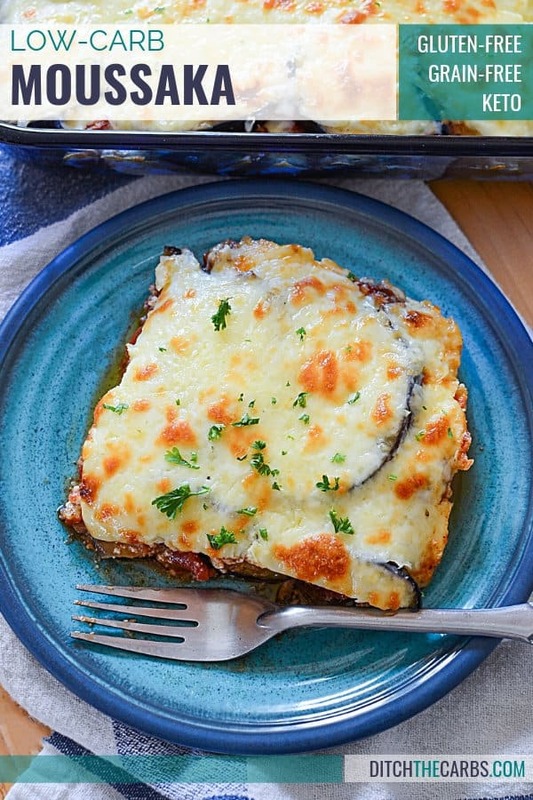 Low carb moussaka is a family favourite that is covered in a cheats cheese sauce. Set the oven to 180C/350F then start making the lamb layer. Fry the diced onion in the olive oil. Add the garlic and cook until the onion is clear. Add the lamb and continue to cook until all the meat is slightly browned. Add the tomatoes and spices, then cook on a low heat for 15 minutes while you make the other layers. Slice the eggplants/aubergines into 1-2cm slices. Heat a generous amount of olive oil in a frying pan, and fry the slices until golden on both sides. 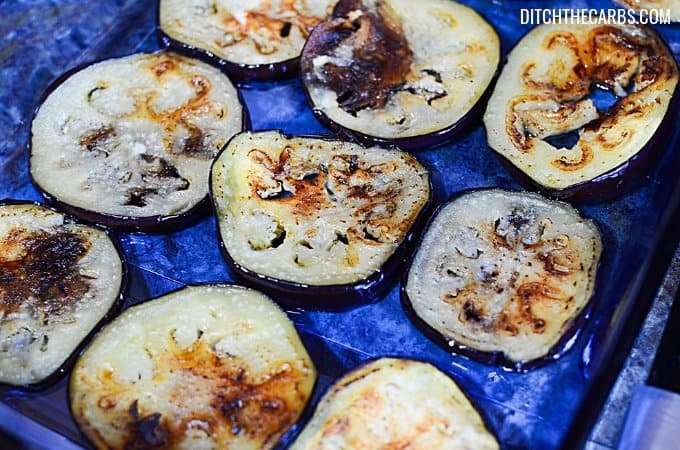 As the eggplant slices are fried, place them in a single layer on the bottom of the baking pan. Keep half the slices for another layer once we assemble the moussaka. In a measuring jug, put the yoghurt, crumbled feta and egg yolks. Whisk together with a fork. Place the lamb mixture onto the baking dish that already has half the eggplant slices lining the bottom. Place the remaining eggplant slices, then pour the béchamel sauce over the entire dish. Sprinkle with parmesan cheese if you like. Bake at 180C/350F for 20 minutes. I think I used my 22cmx30cm (8.5×12 inch) dish. Seriously? You can’t fit a main course with 8 grams of carbs into your 20 gram keto allotment? Just tried the recipe. It is absolutely delicious. I stir fried my mince but I used 1 fresh tomsto and cut some red,yellow and green pepper in it. So the mince was dry. Didn’t use your measurement though.Thanks will definitely be making it again. Overall, it was delicious. The tomatoes were a little heavy and ended up making the dish a little more watery than expected. I would make it again, but with less tomatoes and would recommend oven baking the eggplant first to save time and stove space. Could I use Greek yoghurt instead? And zucinni instead of eggplant? yes, I’m sure they would work. Great ideas. OMG, Libby! I usually make a moussaka recipe that was given to me by the mother of an old beau. Off the boat from Greece. This is better with half the work. My son raved and raved about the “bechamel.” The entire family loved it. Easy enough for weeknight (I make it the day before), but special enough for guests. Don’t know if it bevause I used sweetened natural yogurt. But it tasted horrible! Hi Libby! I’m so excited to try this recipe for the 1st time. When you freeze it, do you cook it, then freeze it or do you assemble, freeze, defrost then cook? I would cook it after it has been cooked. Maybe even cut it into individual portions and freeze them in an airtight container. Pardon what doe you mean cook it after it has been cooked? I would like freezing instructions please. I think she means she freezes it after she cooks it. Libby this dish is SOOOOOO delish!! I made it 2 nights in a row it was so good and all my dinner guests raved about it. Thanks for making me look like a master chef! Absolutely love this recipe! I go heavy on the seasoning and also throw in a spoon of vinegar, a few drops of liquid stevia and a stock cube. That really adds to the depth of the dish. Also a very suitable dish if you have people over for dinner that are not on a low carb diet. Everybody seems to love it. I use cronometer.com I have found many others are too inaccurate because they have ‘user added’ values. All nutrition calculations will differ as there are so many variables, large or medium eggplants, brand of almond flour/meal, brand of dairy products all vary considerably. Mine are a guide only, and I don’t actually count anything any more. If you need to be completely accurate, I always advise readers to calculate their own using their brands they have used. Prepared and ready to go in the oven when wife and daughter get back from MIL’s. Will let you know! It’s delicious but the nutritional info is plain wrong. I used fage 2% and about 5 tablespoons of olive oil and calculated 35g fat, 28g carbs and 25g protein. This is a delicious recipe but it isn’t really low-carb. Eggplants have sugars in them: 1 whole eggplant has 19 grams of sugar + 16 grams NET carbs. I used Fage 2% has my yogurt as it was one of the few under 10 grams of sugar per serving. According to MyFitnessPal, one serving of this recipe has 15 grams of sugar and 18 grams of NET carbs. It is really healthy and a delicious dish but if you are following a Keto diet, this might not be the dish for you. 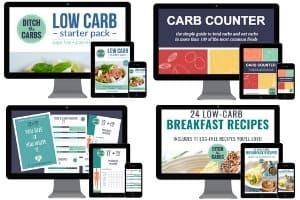 For all recipes, we are LOW carb not NO carb. Choose recipes that fit in wth your carb requirements. You can make a couple of modifications to reduce carbs, like using less tomato, or use a combination of raw tomatoes & paste. Instead of 2 eggplants, you can use 1 eggplant and 1 courgette which is lower in carbs (I’m Mediterranean and we use courgettes & eggplants for traditional mousakka). Also you can use quark cheese instead of yoghurt (3.7g of carbs per 100g of cheese). When I made this I used turkey mince to reduce fats. Hi Libby, I’m looking forward to trying your recipe. I’m in phase 1 of Atkins right now and had a craving for moussaka. Found your recipe in my search for low carb options for the bechamel sauce. I can’t use yogurt in phase 1. Do you think sour cream would achieve similar results? Thanks again for the recipe idea! I use full fat cottage cheese, grated cheese and 2 eggs. Beat it together and pour over. My mother and i are of greek heritage, so we’ll give this a try. it’s different than our family recipe, but we’ll see how it comes out. i’ll let you know. Hi Libby – what a fantastic meal!! 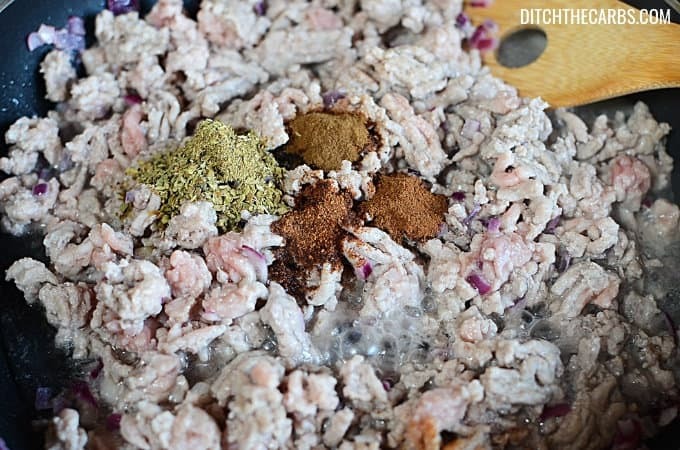 I’m wanting to double the protein per serve, would you suggest just doubling the minced meat would the easiest method? Or what creative genius can you come up with? Creative genius huh? I like you already 😉 To increase the protein I would increase the meat as you suggest, and possibly top it off with more cheese also. I’m so glad you love it, this was one of the earliest meals I adapted to our new LCHF way of eating. Do you think this would work in a slowcooker? Possibly, I hadn’t thought of that, what a great idea. Let me know how you get on. Made this for the first time tonight after searching the web for new low carb ideas. It was absolutely delicious and very filling. Thanks for a great recipe! Second time making this and it’s vital to cook the eggplant well in the flying pan. I LOVE this dish! Hiya, great recipe! Can this be successfully frozen and reheated? It can easily be frozen, just watch the cheese sauce doesn’t split when defrosting. Made this tonight and it was fantastic.. Had to tweek it a bit as only had pork mince but just added more spices. Kids loved it to and the ever fussy husband had 3 servings! You could try and replace the mince meat with more diced vegetables such as mushrooms, leeks, courgettes and a selection of nuts. You can make it vegan, egg and dairy free by also replacing the yogurt/egg/cheese mixture with coconut yogurt. It sets beautifully. Hey thanks for that. I have quite a few vegetarians/vegans asking for advice so that is superb. 1. I only use one can of tomatoes. 2. I spray eggplant slices with olive oil and then broil them for 15 minutes on each side instead of frying. This way they are done much faster, involve less work and they don’t consume nearly as much oil. I serve it either with steamed broccoli (add lemon juice, olive oil, salt and pepper) or a green salad with a vinaigrette. THANK YOU for making low carb so delicious. That’s great to hear how much you love it and especially how you have adapted the recipe further. They are all great suggestions. I like the idea of broccoli with lemon too. Thanks. Libby. I fry the eggplant/aubergine on the tray in the oven as well. Depending on how thick I cut the aubergine it’s 5-10 mins a side. I do put oil on the slices, but it seems to work without the oil too (I sometimes run out of oil for the last slices). It might take a bit longer this way, but you’ve got your hands free to do other things like making the bechamel sauce. I think I got the idea from diet doctor, who recommends cooking aubergine this way in one of his recipes. I bet grilling it with some olive or avocado oil on the stovetop would work well, like in a cast iron pan! I’m trying this soon.